Adults and children alike will love the work out routine they can bring with them, use any time, and see results in their activities. Whether that's violin, core conditioning, martial arts, music practice, shooting, or wrestling, you'll benefit from the strength, mobility, dexterity and flexibility that this trainer develops. 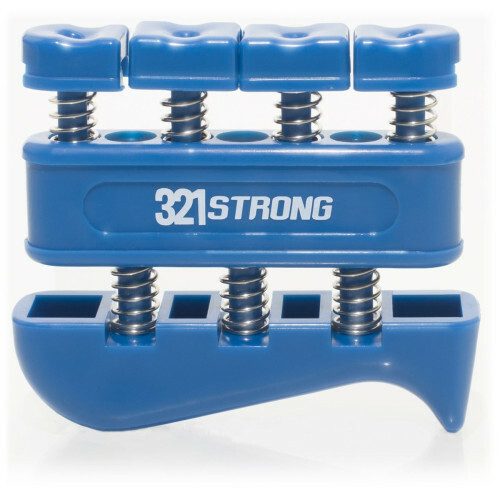 Body Builders, guitarists, martial artists, athletes who want maximum performance, rock climbers, musicians, PT patients, and rheumatoid arthritis and joint pain sufferers all have one thing in common, they all improve by increasing their manual dexterity and finger strength. This simple exercise can be done while sitting at your desk, after school, or whenever you are free and have 5 minutes to spare. Clear your mind of the stress from your hectic day. Doing something so simple on a daily basis as exercising your fingers can remedy the whole situation. Use the resistance to loosen muscles in your hand, and meet your individual needs. Its small size allows you to store and travel with it easily, so you can develop your grip or just relieve stress wherever you go. Made of durable extra strength heavy duty high quality blue plastic with a comfortable ergonomic bottom base. 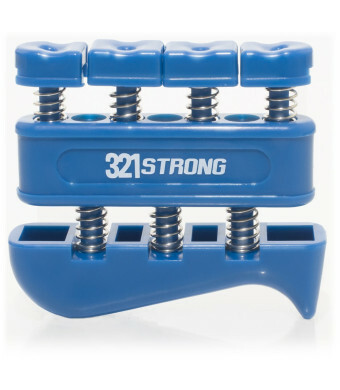 Powerful steel springs provide the pressure as you squeeze each finger button. Truly one of the most important fitness products today, finger training solutions have been around for decades, this classic tool is tried and true - if cutting edge is more your thing, try our other adjustable finger exerciser, B017TA0LPW. 100% lifetime warranty and satisfaction guarantee. We'll refund your purchase if you don't think this is the most effective finger exercise equipment you've ever used.